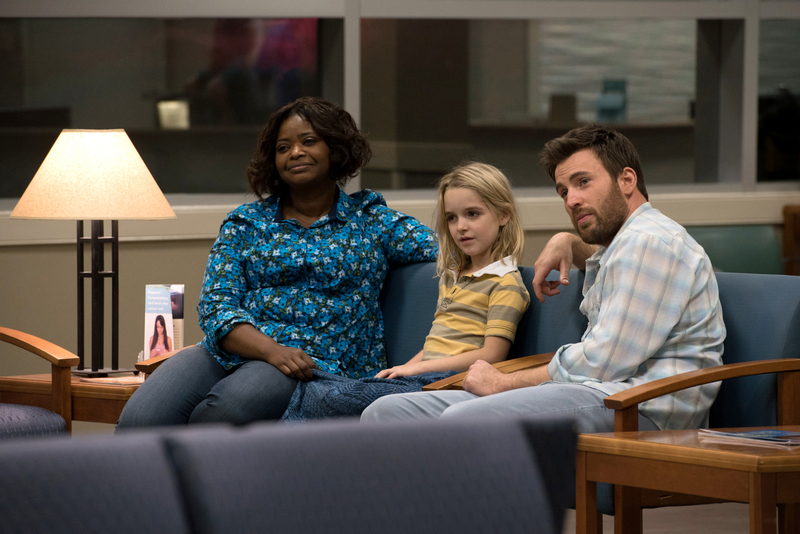 (l-r) Octavia Spencer as Roberta Taylor, Mckenna Grace as Mary Adler and Chris Evans as Frank Adler in the film GIFTED. ©20th Century Fox. CR: Wilson Webb. Evans plays a boat mechanic who ekes out a living in small, coastal Florida town with his seven-year-old niece. As Frank, he does what he can to provide for his young charge, who he reluctantly sends off to public school after homeschooling her for a year or so. As it turns out, Mary (up and comer Mckenna Grace) is brilliant in mathematics, and her thoughtful teacher (Jenny Slate) recommends that the girl be sent to a special school. That draws the attention of Mary’s estranged grandmother (Lindsay Duncan), a wealthy New Englander who years earlier disowned Mary’s mom, who similarly was brilliant but eventually couldn’t cope with the pressure of her remarkable aptitude for advanced math. Hoping to give his niece a more “normal” life and spare Mary the same sad fate as her mother, Frank fights his own mother in court, though it is an uphill battle. He defends his role as guardian with the assistance of Mary’s teacher and a helpful neighbor (played by Octavia Spencer). The drama is directed by Marc Webb (“The Amazing Spider-Man”) from an original screenplay by Tom Flynn (“Watch It”). Evans, who reprises his Steve Rogers/Captain America role in next year’s “Avengers: Infinity War,” spoke about playing an ordinary person, working with his young co-star and two-time Oscar nominee Spencer, and what’s ahead. 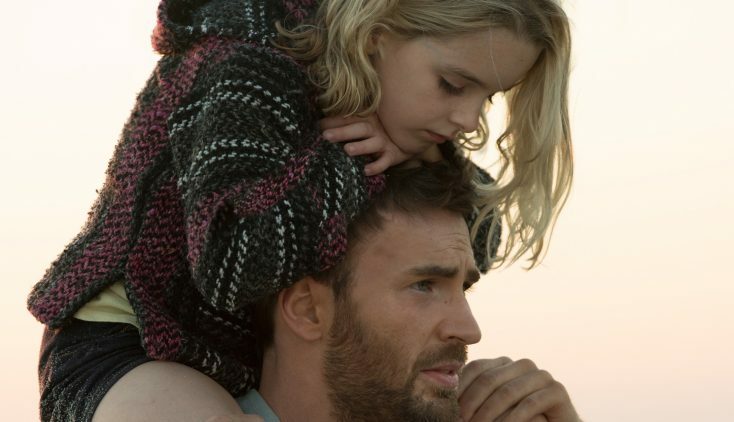 Q: There’s an old adage in Hollywood that says, “Don’t work with dogs and kids.” What did you learn from working with Mckenna Grace on this? Evans: What they say is “don’t try to direct animals and kids” so, luckily, that wasn’t completely my responsibility. But we had a lot of time to rehearse and Marc is wonderful as a director. Mckenna just brings such a level of maturity that I don’t know if that old adage applies, because she really didn’t seem like a kid. Q: What did you learn from working with her? Evans: To have fun. She comes to set every day and she’s just full of life and she’s bouncing off the walls and she’s saying “hi” to everybody. She’s happy to be there. Even when the days are long and you’re tired, and maybe you’ve done more takes than you’d want to do, she’s still looking at this as an incredibly fun experience, which it is. It’s so easy to be kind of acclimated to the experience, and so watching someone so full of life go through it, you remember how lucky you are. Q: Was your chemistry with her instant? Evans: I was there when we first auditioned everybody, and she clearly came in and had the most life to her. Q: Do you remember the day you met? Evans: Yeah, it was during the audition. It’s so tough, because I remember auditioning for things when I was young and how nervous I was. You have these young girls coming in, some of whom were really nervous; some of whom maybe should have been a little more nervous. Mckenna really struck that balance, where you felt that she was nervous, but those nerves showed a maturity. The scenes were heavy, the scenes were emotional, and she went there. She walked out of the room and we were like, “Man, this girl just started bawling in this audition.” When you’re dealing with someone that young, you want to try and harness the truth of youth, but you also need someone who knows this is a job, so it’s tough to strike that balance, and Mckenna just knocked it out of the park. Q: In one scene, she smacks you pretty hard. How was it getting slapped by a little girl? Evans: She went off before that scene, it’s a heavy scene, so she left the room and everyone’s quiet on set. Every actor has had a scene where he’s has to really tap into something emotional, so we all know that environment where on set, everyone is sensitive to the experience. It’s interesting to see someone so young try and tackle that dynamic, that environment. She was gone for a while and then all of a sudden someone’s like, “OK, we’re ready.” Then Mckenna comes on and she deploys. She just launched into it so effortlessly, so committed. The smacking and the hitting, whatever type of social awkwardness that you may think would happen in an actual setting just melted away and you really can drop into the scene, thanks to her. Q: What was it like working with Octavia Spencer? Evans: She’s the best. Octavia’s a real sweetie. She’s got that real maternal instinct and she’s just a love. Q: Can you talk a little bit about this being your reprieve from “Captain America” and the quality of the experiences between that franchise and doing a wholesome, heart-grabbing film like this? Evans: These are the movies that I love; no disrespect to the “Captain America” films. I love those, too. But this is the type of movie I gravitate to as a person. This movie felt a lot like a “Kramer vs. Kramer”-type film and the family dynamics and complexities are certainly the things that I can relate to in my personal life. I’m sure we all can. This one just had a lot of heart and it felt like really fleshed-out characters and Marc Webb is certainly the guy to navigate this ship, so it just felt like the real deal. Evans: I would almost argue that my audience is hoping I do this. There’s an eagerness to see the range in people. It’s enjoyable. If you love someone in a role, it’s almost exciting to see how they tackle something different and something new. If you gravitate towards someone in some arena, I don’t think you only want to see them in that arena. I’m trying to think of a clever analogy with food ingredients or something. If you like one flavor in one dish, you almost want to see how it tastes in another so I wasn’t worried about that. If there was any sort of concern about that, then it’s my goal to show them that I can do that and try to show a variety of sides. Q: Wherever you go, kids probably come to you and want to talk to you. You can make kids smile. That’s a huge responsibility on you, isn’t it? Q: How does your fame as Captain America affect your daily life? Evans: You don’t want to take your role home with you too much, but there’s no denying that there is a certain added responsibility to what comes with playing a role like that. You go visit children’s hospitals and things like that, and you see the effect you have on kids who aren’t just fans, but are in need of something more than just escape. There are kids that need hope, or something like that. To some degree it truly humanizes it. It makes it more than just movies, which is great and it’s wonderful and it’s a responsibility I don’t take lightly. Q: Are you actually more involved in a variety of charity organizations? Evans: Yeah, sure. I try to stay involved. I try to stay active. I try to respond when I can to impact where it’s available. It’s tough, because a lot of kids certainly look up to the role, so you want to try and respect that and know that you have a responsibility as a result of this character you play. Q: How you’ve managed to keep your life balanced? Evans: I guess you give cliche answers—family and friends. Certainly, in the industry, you see how they always say fame makes you more of what you already were. So, if you already had certain flavors inside you, fame is just going to bring that out of you. I’d like to believe before I ever started acting I had a pretty good head on my shoulders. If you had a compass prior to diving into the acting pool, you can identify when those shifts happen in a negative fashion. I’m not going to sit here and say that every step of the way I haven’t had little hiccups and pockets where you leave a scenario and you say, “Whoa, that wasn’t me.” It’s up to you to recalibrate and adjust and make sure you don’t continue down that road. Q: “Avengers: Infinity War” is due out next year. Is there something you’re working on in the interim? Evans: The next thing I’m going to do is a (spy) film called “Red Sea Diving Resort.” It is a little bit of a smaller film. The beautiful part about acting in film is that you’re afforded the opportunity to engage in variety of projects. Most actors that I know are pretty mercurial by nature, so if you do this one month, you just want that next month. The beautiful thing is “Captain America” affords me the opportunity to taste the big budget, big thing, so I’m not necessarily seeking that out. In my downtime, or in my off -“Captain America” months, I certainly am looking for smaller things that touch different chords. Q: One last thing, did Mary’s shelter cat really have just one eye? Evans: No. It’s CGI. CG-Eye. Get it? I’m going to use that joke all day.